The Marlon 350E crimps coil from 6mm through 50mm up to a 14″ binding length. It is foot pedal operated and cycles at 50 cycles per minute. There are interchangeable cutter blades for varying coil diameters. 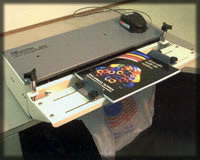 This machine provides a perfect crimp every time.